* (NEW) All new Material Design ! * (UPDATE) Updated built-in Hindi keyboard. * (NEW) Favorite, History features added. * (UPDATE) Hindi to English added. 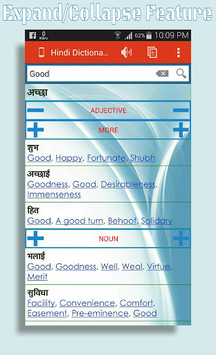 Get English meanings in details of any Hindi word or sentence. Just write any Hindi word or sentence in the text box.